Welcome to this hands-on guide to campaigning in Europe against trade deals such as CETA and TTIP. Its aim is to support you as a national or local campaigner, by helping you to sharpen your arguments and inspiring you to turn your knowledge into action. Note : The agreements being negotiated between the EU and Canada (CETA) and the EU and the United States (TTIP) will have important implications for how investment agreements look in the future. Negotiators are clear that they intend to replicate what is agreed in bilateral negotiations with countries across the world, including in the global south, as well as it being a template for any future global agreement. So those concerned about investment that fosters sustainable development need to engage with CETA and TTIP as well as a range of other Trade Agreements. 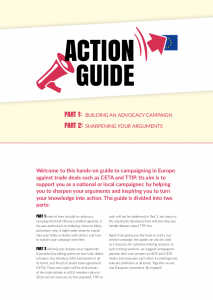 That is why the BITs in pieces project has developed two advocacy guides, one for European campaigners focusing more on CETA and TTIP and one for activists in Africa looking at the important agreements for that continent.